TASK: — A Task is a stack of activity i.e. a Task is a group of activities arranged in a Stack. 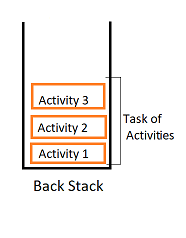 Back Stack: — Order of Activities in which they are opened, reside in stack called Back stack. By default android launches activities in standard mode. It always creates a new instance of an activity. Without taking into consideration that stack already has an instance of that activity, whenever onCreate() method of an activity is called its new instance is created. 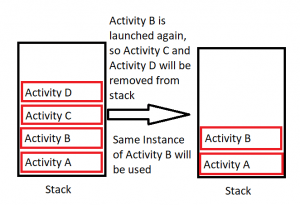 In this, if the instance of an activity is already present in stack then it does not create another instance of that activity rather than reuse the same i.e. It will route to same Activity (only if that activity is on top of the stack) else it will create new instance. Single top launch mode routes Activity by “New Intent ()”. To understand Single task Launch Mode in Android you need to understand “task affinity” first. You can give any name to stack (android:taskaffinity=”com.some.task.affinity). Step 4: If Activity B is launch again, then Activity C and Activity D will be pop and Activity B will be reused. On click of recent button both stacks goes in background, so which ever stack is selected, it will become current stack and activity launched will be open in that current stack. The instance of activity is reused. Whenever an activity is declare as “Single Instance”, then that particular activity will automatically open in another stack. 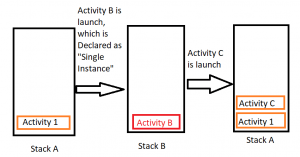 Activity B is declare as single Instance as launch mode so it automatically open in another stack(Stack B) and all activity launched before and after activity 1, opens in same stack(Stack A).